This is why it is so important for us continue the fight. We must continue to push for policies that will build a stronger middle class and which lift us all up, despite our race, ethnicity, gender, religion, and sexual orientation. It is difficult to tell what is going to happen to the people of West Virginia and across the nation in the future. But one thing is for sure, we are committed to listen more, work harder, and never give up on our vision for building a prosperous West Virginia where everyone has a meaningful and equitable opportunity to thrive. 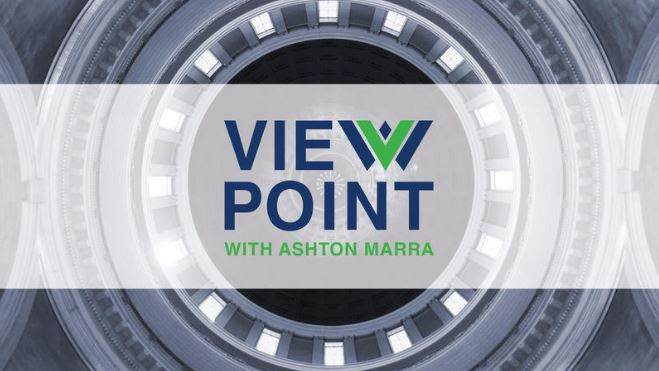 This week, Ted joined WV Public Broadcasting’s Ashton Marra to talk about the results of the governor’s race along with conservative columnist Laurie Lin of WVPB’s The Front Porch. Listen here. Ted also had this to say in the Charleston Gazette-Mail about the likelihood of a rebound in the state’s coal industry: it is likely to continue to decline, unless Trump or the state Legislature decide to ban hydraulic fracturing for natural gas or “crack down on renewable energy.” Read the full article here. Taxes don’t play a major role when business leaders decide where to locate and expand their companies. 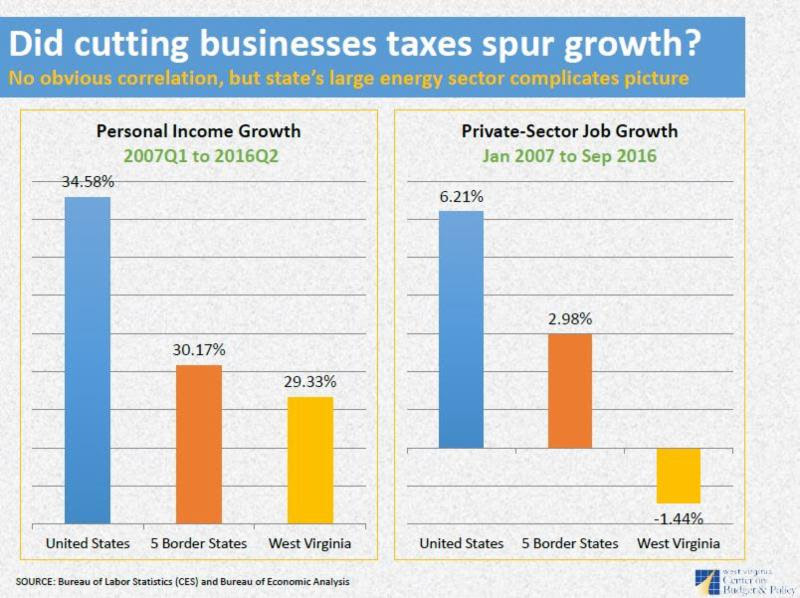 And cutting taxes has not brought jobs to West Virginia. In fact, we have fewer private-sector jobs in the state now than we did in 2007, before business taxes were cut by hundreds of millions of dollars. This was the topic of this week’s Lunch and Learn at the Covenant House. View Ted’s full presentation here. 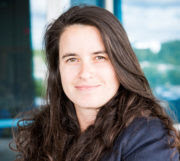 This week the WVCBP welcomed Caitlin Cook, our first full-time Communications Director. 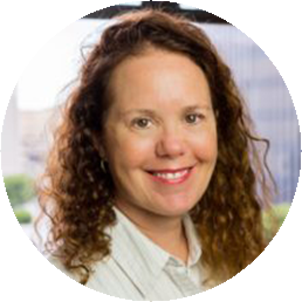 Caitlin is a native of Charleston and brings business and public outreach experience to her role. She holds a B. A. in Journalism and a B. A. in Philosophy from Youngstown State University. 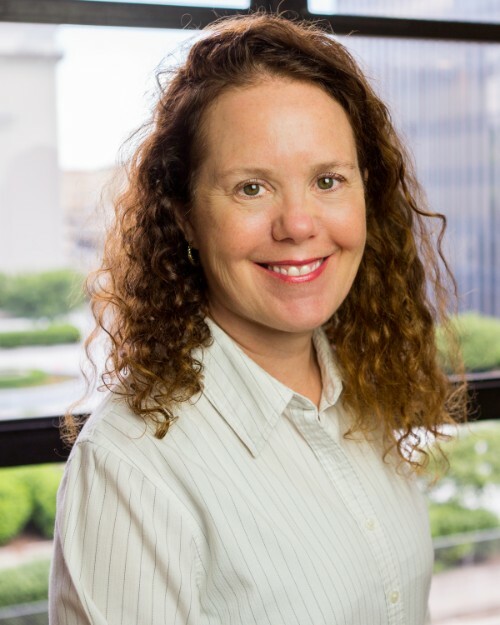 Caitlin will work to foster an environment of increased understanding and collaboration on budget and economic issues among citizens, partners and legislators through strategic communications. On November 2, Marion County passed a resolution in support of the West Virginia Medicaid program after hearing about the number of Marion County children, adults, people with disabilities, and lower-income seniors who rely on Medicaid health insurance coverage. In Marion County there are 14,444 people, or 26% of the county population, who were enrolled in Medicaid in July 2015. County enrollment varies from 48% in McDowell to 15% in Monongalia County. The presentation, by Lisa Diehl of West Virginians for Affordable Health Care (WVAHC), included data on the new dollars that came into the county through Medicaid. This flow of money generates new jobs in the health-care sector, and has a positive ripple effect creating even more jobs across all other economic sectors. For a copy of the resolution or to have a speaker from WVAHC come to a meeting in your community, contact Kathleen Stoll. For too long, policymakers in West Virginia have relied on a trickle-down approach to state economic policy that emphasizes putting more money in the hands of the wealthy and large corporations. Instead of pushing money upwards in the hope it will trickle down, policymakers should focus on expanding the middle class – who are the real job creators. Read Ted’s complete op-ed in the Charleston Gazette-Mail.